Leading international surgeon association partners with Medelita to offer exclusive member benefit. Here at Medelita, we feel rather strongly about the connection between appearance, confidence, and poise. 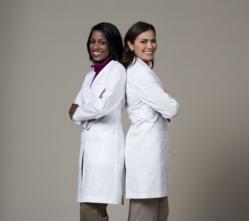 Medelita® has partnered with the Association of Women Surgeons (AWS) to offer an exclusive discount on premium medical lab coats and physician scrubs. Medelita will offer a special benefit to AWS members, providing each member with a 15% automatic discount on any order of lab coats or scrubs made at medelita.com. The Medelita member benefit program is designed to provide support to regional and local communities women surgeons in over 15 countries worldwide. This member benefit is available to all regional and county medical associations across the U.S. and around the world on a case-by-case basis. Please contact contact.us(at)medelita(dot)com for more information. The Association of Women Surgeons is committed to supporting the professional and personal needs of female surgeons at various stages in their career - from residency through retirement. Since our founding in 1981, AWS has set up many programs with the specific objective of promoting the professional growth and advancement of our members. By working together, and with organizations like the American College of Surgeons, AWS hopes to bring down barriers that remain for women in surgery. With over 1,400 women surgeons as members, AWS is one of the largest organizations dedicated to enhancing the interaction and exchange of information between women surgeons. Truly an international organization, AWS has members in 15 countries, including: Australia, Beirut, Canada, the Commonwealth of Dominica, Germany, Greece, Hong Kong, Ireland, Israel, Japan, Latvia, Malaysia, South Africa, Switzerland, and the Unites States of America.